Sometimes, I never really know just how special the subjects I photograph really are. During the second night we spent on the Rewa river, I was dealing with blistered, sunburned hands as well as moderate fatigue. After dinner, it was tempting to crawl into my hammock and snooze, but I forced myself to go out, at least for a bit, and try for some nighttime arthropods. A leafcutter trail briefly caught my attention, but doing any elaborate setup for shooting was beyond me that evening. 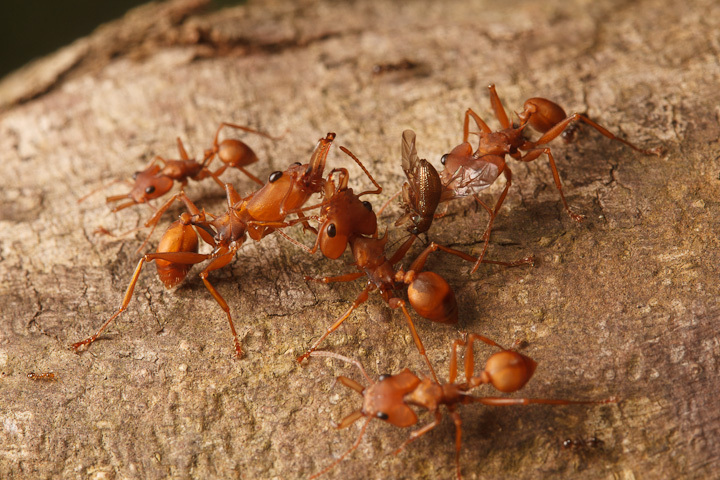 Right in our camp, just a few metres from the cooking tarp, I found these amazing ants. 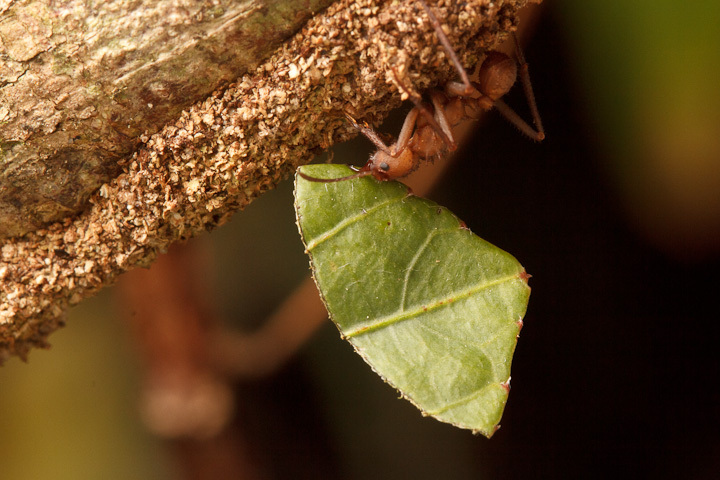 At first I thought they were leafcutters, but when I got closer I realized that this was some kind of myrmicine version of a trap-jaw ant! I had never seen these in French Guiana, and in fact did not know of their existence. These were Daceton armigerum, one of only two species in the genus, related to the leafcutters, but tree-dwelling and predaceous. 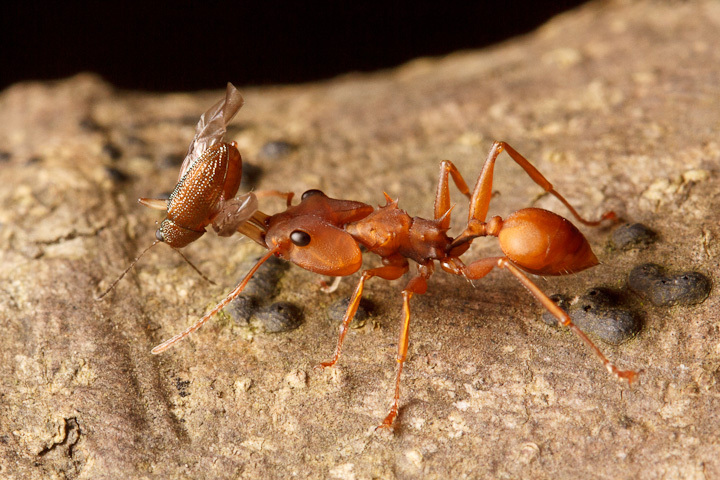 They have evolved these amazing, lightning-fast mandibles, like their ponerine equivalents, which they use for seizing prey. Their extremely crazy-shaped heads contain the heavy musculature needed for this strategy, and a trigger mechanism to release all of the force built up in a single stroke. For a great paper on this, showing the internal morphology, click here. 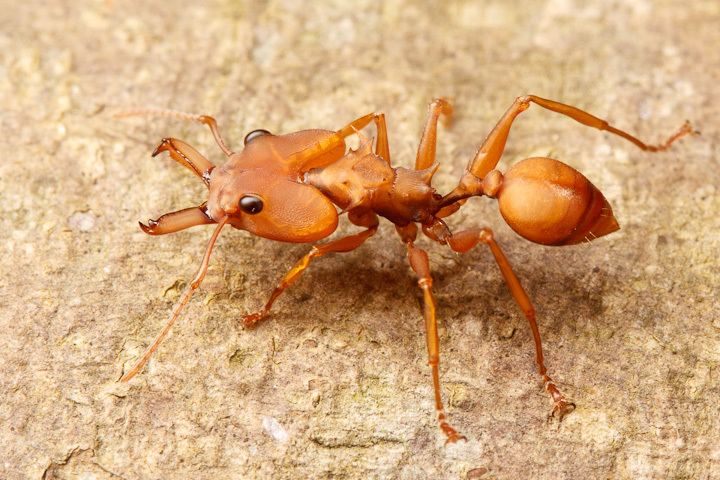 Unlike the ponerine trap jaw ants, they are quite fast and active, with seemingly large colonies contained in hollow trees. 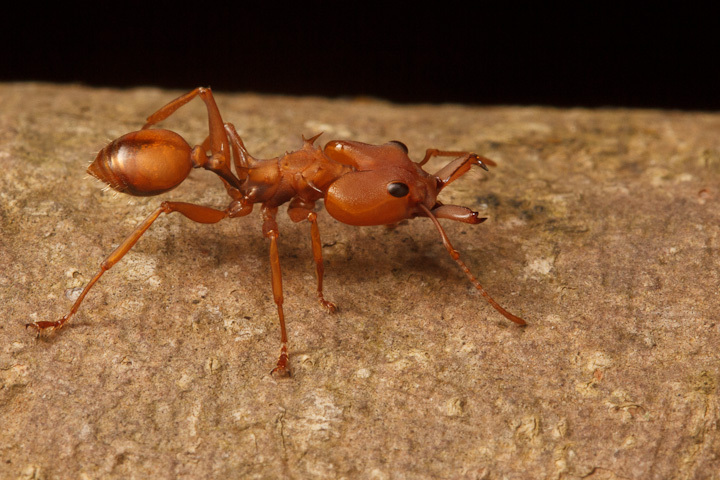 Adult-adult trophallaxis is a difficult affair with these massive jaws, and the ants seem to use their maxillae for this. I can’t get over these amazing heads! A few of the ants walking towards nest entrances had prey, such as this pretty but unfortunate beetle. 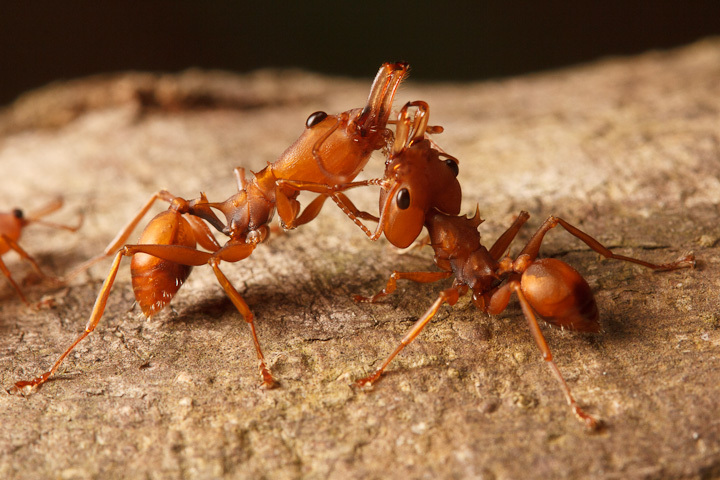 Social life: most ants that passed each other on foraging trails up the tree at least antennated each other. 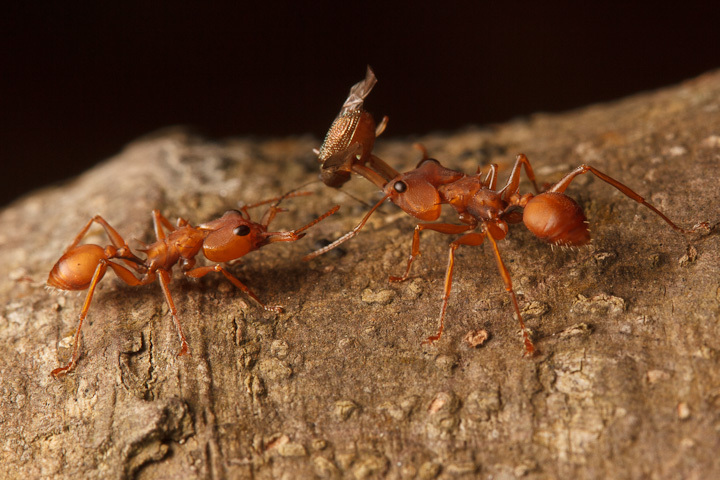 It seems that other than tiny Crematogaster, no other ants are tolerated on this tree. 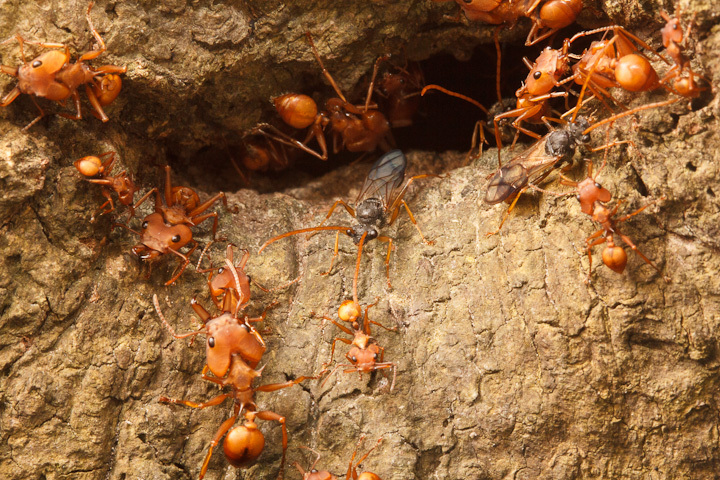 A few workers were carrying males, but whether these were alive or dead was hard to tell. 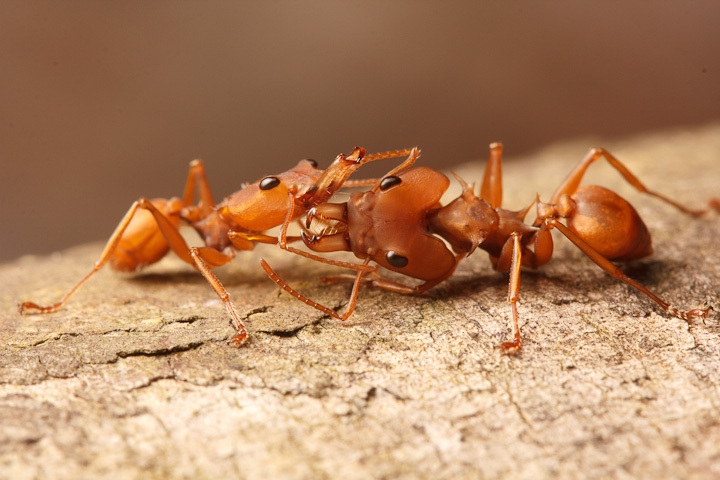 The males looked very different from the workers, as with most myrmicines, but really not that different from a lot of other mymicine males. Nest entrances seemed to be scattered around the trunk, and these workers looking out show that there are definite castes in this species. 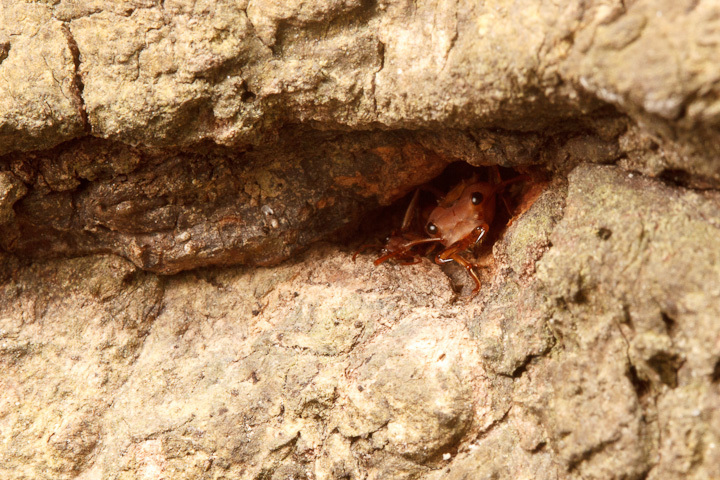 Some nest entrances were busier than others! 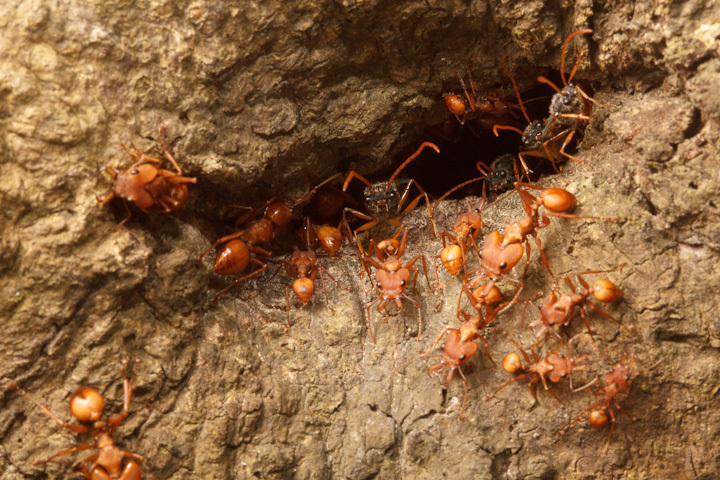 Here are some males poking out along with a range of various-sized workers. With a bit of waiting, the males came further out. 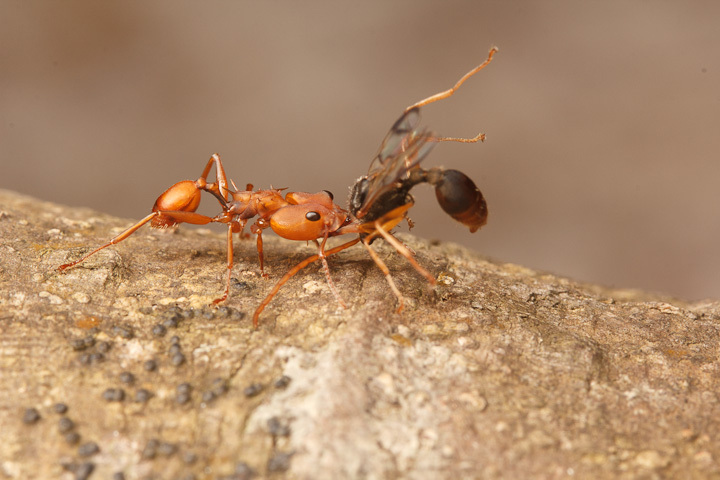 Daceton armigerum was certainly one of the oddest ants I had ever seen. If I had known how unusual it is to photograph them in situ, I probably would have devoted more time to photographing them. The lesson is, even if something is big, obvious and odd, if it is from the rainforest, it may not have received much attention! Gronenberg, Wulfila. 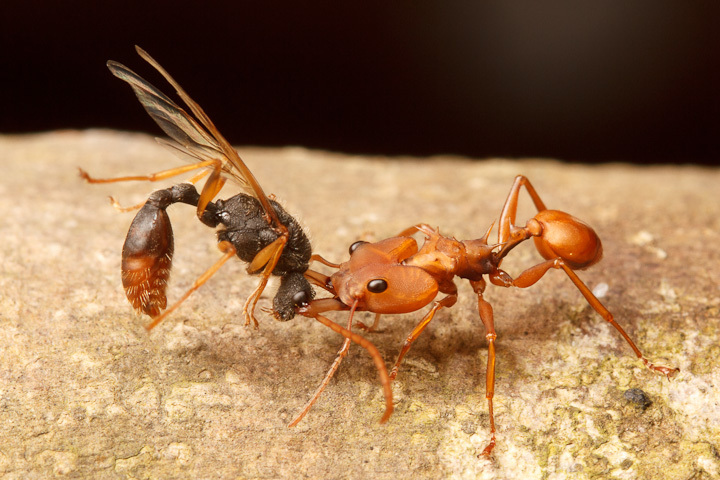 “The trap-jaw mechanism in the dacetine ants Daceton armigerum and Strumigenys sp.” The Journal of experimental biology 199.9 (1996): 2021-2033. Moffett, Mark W., and John E. Tobin. 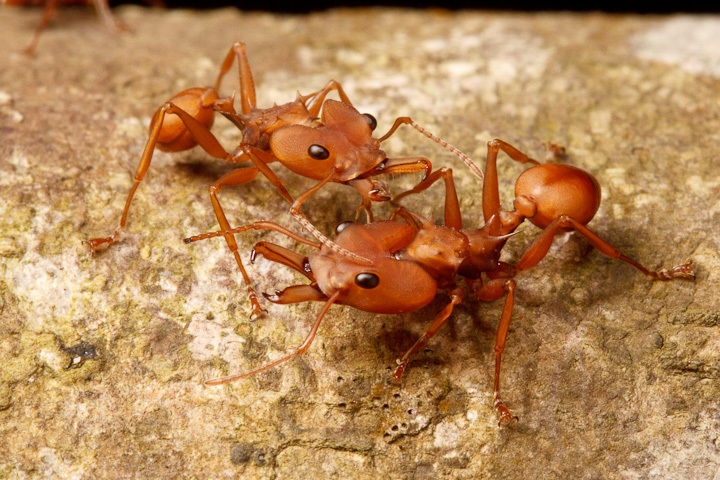 “Physical castes in ant workers: a problem for Daceton armigerum and other ants.” Psyche: A Journal of Entomology 98.4 (1991): 283-292.